With its ‘cult of ignorance and anti-intellectualism’ the U.S. risks falling behind rivals in Asia. Asimov is right on the mark, and this cult of ignorance is the most serious national security issue facing the U.S. today. It is more important than the external threats from terrorists or the rise of a politically and economically powerful China. And a major part of the reason it is such an major issue for Americans to fix is that our immediate competitors, particularly those in Asia, have managed to create a culture in which rather than a cult of ignorance, a cult of intelligence plays a major role in shaping attitudes about the world and, thus, policies about dealing with other countries. Many Americans are aware that the U.S. does not score well on measures such as international student assessment tests when compared to other industrial countries. For example, the 2011 Trends in International Mathematics and Science Study (TMISS) the top five countries for math were Singapore, South Korea, Hong Kong, Taiwan, and Japan—the U.S. is not in the top ten. It is better by 8th grade, where the same counties are in the top five (although the order changes) and the U.S. makes number 9. Roughly the same pattern can bee seen for science results. This doesn’t seem too bad, but in a different testing organization’s measure, the Programme for International Student Assessment, the U.S. does not fare quite so well, scoring 36th for math, 28th for science, and 24th for reading. With the exception of science, where Finland is ranked 5th, all of the top five countries in this measure are from East Asia. American policy has generally worked from the assumption that the problem lies in basic weaknesses in the structure of our educational system with its inherent inequalities and the way in which our school curricula are constructed. These certainly have contributed to comparatively weak scores. 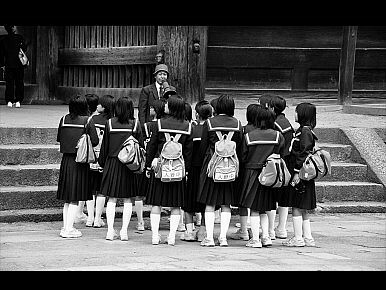 I have long been convinced that one of the reasons Japan’s educational system is better than the U.S.—at least in the sense that a very broad swath of the general public receives a good and equal education through high school—is related to funding. The U.S. system generates inherent inequalities in school funding by depending upon property taxes. Even in states where there is some (usually grudging) redistribution of wealth to support public schools in poor areas (in Texas it is called the Robin Hood law), it is obvious that children in wealthy areas receive a better education with far greater academic and other resources than those in poorer areas. In Japan, because there is a national curriculum and a significant portion of the funding for public schools comes from the national government, in addition to funding from prefectural and municipal governments, there is considerably less inequality in distribution of and access to quality education than in the U.S. In addition, we do not see in Japan significant numbers of the types of religious schools that are designed to shield children from knowledge about basic tenets of science and accepted understandings of history—such as evolutionary theory or the religious views of the Founding Fathers, who were largely deists—which are essential to having a fundamental understanding of the world. The reason for this is because in general Japanese value education, value the work of intellectuals, and see a well-educated public with a basic common knowledge in areas of scientific fact, math, history, literature, etc. as being an essential foundation to a successful democracy. John W. Traphagan is Professor of Religious Studies and faculty affiliate of the Population Research Center at the University of Texas at Austin. The defeat of Sen. Richard Lugar at the hands of a Tea Party-backed candidate says much about U.S. politics.